OK, let’s paint the picture. Here you are walking around in NYC, looking cute with your besties and then suddenly hunger pains hit you like a ton of bricks. Though you want to continue shoe shopping in that cute shop – the craving for falafel drives you out of the store. A few blocks away and after reviewing a few places up for grabs – Mamouns– a cute spot tucked in the middle of Greenwich Village and SOHO on MacDougal Street beckons for your attention. P.s., do not get intimidated with the long line of people – instead patiently wait and soon enough the evidence will prove why it’s so popular. 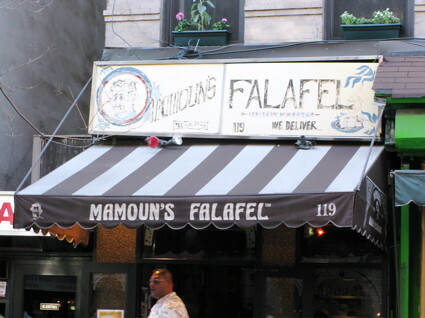 Mamoun’s is an authentic Middle Eastern, and family operated foodie joint that continuously delivers the hype since 1971. The difference between this place and other Falafel establishments is that everything is freshly made from scratch- and yes it’s hella yummy- hence the long lines. Upon entering the place, the beautiful scent of spices just colonizes your senses. A personal favorite is the Falafel combinations available. Customers can choose from the Vegetarian or Meat Combos – in a sandwich or in a plate. You can also add spinach pie, red lentil soup or an array of other side dishes to compliment your choices. Vegetarian dishes include Hummus, Tabbouleh, Baba Ganouj and of course the best Falafel deep fried for your pleasure with served with Tahini sauce. For all you carnivores, you can choose from Shish, Kefta (Lamb) Chicken or Shawarma ( combo of Lamb and Chicken – spiced to perfection. Come here at-least one time and check it for yourself. If you are in the East Village, check out their St.Mark’s location. Other zip codes include New Haven, CT, Hoboken and New Brunswick in Jersey. For more information check out their website – this place rocks.